TERMS, CONDITIONS AND COMPANY POLICIES. All orders received before 1.30pm are sent Next Working Day Delivery (not guaranteed). Special deliveries can be arranged on request. Prices shown are for mainland UK only. Standard UK mainland next day carriage is charged at £10.00+VAT, and £12+VAT for oversized items, ie grooms with 1.6M pole. Small accessory/parts orders under 1kg in weight can be sent first class post at a charge of £3.50+VAT or next day courier for £6.50+VAT. Free delivery on all Alltec chemical solution orders over £150 (ex VAT) only applies to standard UK delivery addresses; excludes Highlands, Channel Islands, overseas, etc. Excludes bulk or special orders – please call to discuss your requirements. Carriage charges for machines and pallet orders are priced depending on weight and size. Please call a member of the sales team for more information. Any items not available from stock at the time of purchase will be sent out as soon as they are available, no additional carriage will be charged. Highland Post Codes, Jersey, Guernsey and anywhere off-shore will be charged at cost price of shipping. If you select the UK Mainland Option on shipping you will later be charged in full for the shipping costs. PLEASE CHECK ALL DELIVERIES UPON ARRIVAL AND SIGN AS ‘DAMAGED’ IF THERE IS ANY NOTICEABLE DAMAGE TO THE BOX. PLEASE NOTIFY US IMMEDIATELY OF ANY DAMAGES OR MISSING ITEMS. Under the Consumer Protection (Distance Selling) Regulations 2000 you have the right to cancel your order within a period of 7 working days. The period of 7 working days begins on the day after the day you receive your goods. Please be aware that your right to cancel does not apply to certain goods that we sell, for example, items made to order, such as customised portable machines. You must inform us of your wish to cancel in writing either by letter or email within a period of 7 working days beginning on the day after the day you receive your goods. You must take reasonable care of the goods and may inspect and assess them, but not use them. You should return goods to us in their original packaging, wherever possible, as soon as possible after informing us of your wish to cancel. If you return goods to us, we will not be responsible for any loss or damage to them during transit and we recommend that you use a recorded or secure delivery method. If goods are lost or damaged in transit, we may charge you, or not refund to you, amounts that are attributable to the loss or damage. Items sent in error will have full carriage refunded, items ordered in error will not be refunded carriage charges. The Alltec brand guarantee: if you are not completely happy with your Alltec branded product, in addition to your statutory rights, we offer a full money back guarantee. Goods need to be returned in ‘as new’ condition, and at your own cost within 7 days from the date of invoice. Delivery carriage will not be refunded. Goods suffering from damage and/or wear & tear may not be accepted. Returns will only be accepted by prior agreement with management. Refunds are due to management discretion and will be paid via the original payment method. Additional terms and conditions apply to cancelling orders for certain goods such as made to order items, large items of furniture and domestic appliances. Please refer to the terms relating to the supply of those goods. Additional Delivery Charges – Saturday, and AM delivery charges will not be refunded if you cancel or return your order. We offer 12 months Warranty on new Portable Machine and Parts. Any parts that have been replaced and are not part of the original build will be covered under their own Warranty if applicable. Machines must be returned to Alltec at your own cost for inspection. For warranty replacement parts sent out by post/courier; these will be invoiced and only credited upon return of the faulty item, these returns must be made within 28 days otherwise the full invoice value will become payable. Warranty returned items will be inspected before credit is issued, wear & tear or user fault will invalidate the warranty terms. Further Terms and Conditions apply, please contact us for full information. Acceptance of your booking for repairs or servicing of your equipment constitutes a binding contract between the yourselves, The Customer, and Alltec Network Ltd.
You may cancel up to 24 hours before the booking date without penalty by emailing us at info@alltec.co.uk or by calling us on 01763 208222. If you fail to cancel your booking in advance, or do not attend, a £50+VAT cancellation fee will apply and will be invoiced and due immediately. All servicing/repairs must be paid for in full prior to/upon collection of the equipment. Unless a prior quotation is specifically requested, the service/repairs will be carried out and charged for accordingly. There are set charges for servicing and labour, parts will be charged at list price – please contact us for current prices. All prices exclude VAT. Occasionally, due to unforeseen circumstances bookings may be subject to change by Alltec Network Ltd, alternative dates will be offered. We do not accept any liability for damage, loss or theft resulting from the storage of your equipment at our premises. All servicing/repairs are carried out at our location: Alltec Network, Butts Business Centre, Fowlmere, Royston, Herts, SG8 7SL. Special offers are emailed out from time to time and must be used on-line unless stated otherwise. Late orders on time sensitive offers will not be accepted. All offers are limited to 1 use per customer and cannot be used in conjunction with other offers/codes or account discounts. Any special offer orders must be paid for at the time to qualify. Z code products or Own Label items are excluded from all special offer discounts unless otherwise stated. Free delivery special offers are only applicable to UK mainland destinations. Full payment is required to secure bookings. 20% discount off additional places booked from the same company for the same dates – Excludes NCCA entry course. NCCA free membership offer; to qualify training must be paid for in full and is not available with any other offer or discount. Lunch and refreshments provided, please advise of any dietary requirements. Occasionally, due to unforeseen circumstances, dates may be subject to change, alternative dates will be offered for places already booked. Bookings are non-refundable but may be transferred at the managements’ discretion. Please note that discounted training school bookings will not be transferable. We apologise for having to implement a strict cancellation policy, this is due to non-paid bookings being cancelled at a late stage. Our school places are limited so that each trainee will receive a high level of instruction and attention. Unfortunately, late cancellations do not give us the opportunity to fill these cancelled spaces. Cancellations more than 8 days before the start of the school: You may be offered a place on the next training school plus a £30 amendment fee. No shows: The full cost of the school will be charged, no refund, credit or transfer of dates will be issued. It is not mandatory to register in order to obtain our downloadable literature, you may download any literature from our ‘Extras’ page without registering, or by emailing us on info@alltec.co.uk, or calling us on 01763 208222 and stating your request. These manual requests will not opt you into any marketing emails nor will we record your details (unless a hard copy is requested therefore we will need to enter your address on the Royal Mail website in order to print your postage label.) If you wish to manually request information and would like to opt in to our marketing programme, please state your specific consent, you would be able to opt out again by clicking unsubscribe in any email or by contacting us by phone or email with your opt out request. These terms and conditions govern your membership of the Rewards Club and the use of your Rewards Club card. They also set out the terms of the contract between Alltec Network Ltd (“us”/ “we”) and you (“you”/ “your”). Please read them carefully and keep hold of a copy for future reference. 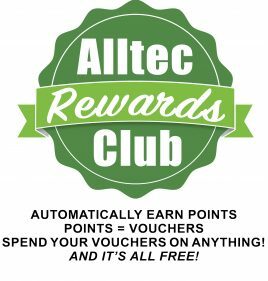 If you have any questions about these terms and conditions or your membership of the Rewards Club, then please call Customer Services on 01763 20822 or send an email to info@alltec.co.uk. The Rewards Club is only available to residents of the United Kingdom who are at least 16 years old. Only one membership per person/email address is permitted. Membership of the Rewards Club is personal to you. You may not share or transfer your points, although your friends and family can of course apply for their own online shopping account. To start collecting points, just register your online shopping account at: www.alltec.co.uk. You will collect points automatically as you complete checkout as long as you are logged in to your account. You will be able to view your account activity in the My Account section of the website. Once you have reached the allocated points level you will receive a coupon by email for use online only. Your account will remain active unless you request your account to be closed, any remaining points will be forfeited. Points are valid for 12 months from the date of issue. You can only use your points coupon online when placing an order. Orders must be paid for when placed to qualify for points. If orders are accepted with the bank transfer payment option, points will not be added until payment receipt is confirmed. Alltec Network Ltd are committed to protecting your privacy. We will not sell, trade or rent your personal information to other companies. We use the information we collect about you to process orders and to provide a more personalised experience; to inform you about events, company changes, competitions and special offers that we think you will find of benefit to your business or interests. We will not collect any personal information about you except when you specifically and knowingly provide such information. “I”, “our”, “us”, or “we” refer to the business, Alltec Network Ltd.
• When you order, we request your name, e-mail address, mailing address, telephone number, credit card number and expiration date. This allows us to process and fulfil your order and to notify you of your order status. We do not store any payment data but do retain your contact details. • When you enter a competition or other promotional feature, we may ask for your name, address and e-mail address so we can administer the competition and notify winners. • We may also use the information we collect to notify you about events, changes and special offers that we think you will find of benefit to your business or interests. Any email marketing messages we send are in accordance with the GDPR and the PECR. We provide you with an easy method to withdraw your consent (unsubscribe.) If you unsubscribe we will cease all marketing emails but will still hold your data on a Contractual basis (for instance on our sales software.) You may request that we remove all data held on file for you, however this will include deleting your sales information; invoice/delivery addresses, contact numbers and invoicing/statement email address. If you would like to opt out of marketing but retain your sales information you can do so by emailing us and stating your preferences See any marketing messages for instructions on how to unsubscribe, you can also unsubscribe at any time by emailing us at info@alltec.co.uk or calling us on 01763 208222. It may be helpful for you to know what information we collect, if you would like to know what data we have kept, or if you wish to remove your consent or amend your preferences on what data we keep, you can make a request by emailing info@alltec.co.uk or calling us on 01763 208222. Please note that by requesting we remove all data held on file for you, this will include deleting your sales information; invoice/delivery addresses, contact numbers and invoicing/statement email address. If you would like to opt out of marketing but retain your sales information you can do so by emailing us and stating your preferences. Use of Our Site constitutes Your acceptance of these terms and conditions and Your waiver of any and all claims against Alltec Network Ltd, its parent company, subsidiaries, affiliates, contractors, agents, officers, directors or employees arising out of Your use of Our Site or any materials, information, opinions or recommendations contained on Our Site. All content included on Our Site, such as text, graphics, logos, button icons, images, audio clips and software, is Our property or that of Our content suppliers and is protected by U.S., UK and international copyright laws. The compilation (meaning the collection, arrangement and assembly) of all content on Our Site is Our property protected by U.S. UK and international copyright laws. All software used on Our Site is Our property or that of Our software suppliers and is protected by U.S., UK and international copyright laws. You may electronically copy and print in hard copy portions of Our Site for the limited purpose of placing an order with Us or using it as a shopping resource. Any other use-including reproduction for purposes other than those noted above, modification, distribution, transmission, republication, display or performance-of the content on a Site without Our prior written permission is strictly prohibited. Unauthorised copying of the software, or failure to comply with the above restrictions, may result in severe civil and criminal penalties. Unauthorised duplication of the software constitutes copyright infringement and, in the United Kingdom, is punishable in a criminal action by a fine of up to £250,000 and imprisonment for up to five (5) years. In addition, civil penalties allow the recovery of actual damages based on the number of copies produced plus the profits of the infringer, or statutory damages of up to £100,000 for willful copyright infringement. Trading Address: Butts Business Center, Fowlmere, Royston, Herts, SG8 7SL.